Lando & Chewbacca go undercover to discover the final location of Han Solo. Lando & Chewbacca, looking for information on Han's whereabouts, arrive on Arcan IV to meet with a gang led by Lemo & Sanda, who had previous dealings with Han. 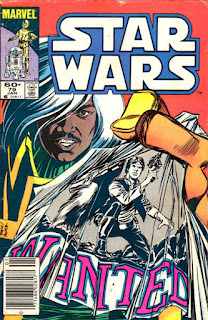 Aware that the gang is hunting for a pair of relics, the Dancing Goddess & the Minstrel, Lando sells them the idea that Han is an accomplished treasure hunter who can help them, if they in turn can locate Han. The gang invites Lando to dinner, planning to find out what he knows about the relics, then kill him. At dinner, they get him drunk, but also let slip that Han will soon be arriving at Jabba's palace. However, the intoxicated Lando accidentally blows his and Chewbacca's cover, leading to a speeder chase that culminates in Dafi, one of Lemo & Sanda's gang, spotting the Minstrel in Lando's possession. Claiming it for herself, she turns on the rest of the gang when they arrive, and in the ensuing confusion, Lando & Chewbacca return to their ship, pleased to have finally located Han, and as they leave the planet, Lando wonders what the gang would have done had they known he also possessed the Dancing Goddess all along. 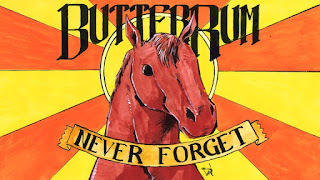 140 cards (including the checklist card), plus a ten card holofoil insert set, available in four variants (red, bronze, silver & gold), a ten card Masterprints insert set, and a nine card PowerBlast insert. Additionally, there is a parallel set in which all 140 of the main cards are produced with the Hildebrandt brothers' signatures reproduced on the front of each card in gold foil. 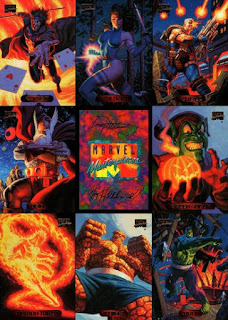 Cardfronts are full bleed, featuring only the character name center-bottom and the Marvel Masterpiece logo on the top left corner, both presented in gold foil. 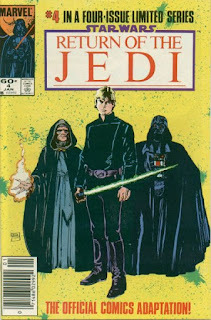 Cardbacks are landscaped, featuring a zoomed-in reproduction of the cardfront image, along with a brief character bio and a behind-the-scenes quote from the Hildebrandt brothers regarding the creation of the card specifically (or the set in general). The Rebels destroy the second Death Star as Darth Vader turns against the Emperor. As the Rebel fleet arrives at the Death Star, Han's team of Rebels penetrate the shield generator bunker & Luke is brought before the Emperor, who revels he has orchestrated recent events to lead the Rebels into a trap. Outside, the Death Star begins targeting Rebel ships, while on Endor, Han's team is captured, prompting Luke to strike at the Emperor in anger. But Darth Vader stops him, and the two begin to duel. On Endor, the Ewoks mount a counter attack, allowing the Rebels to escape and get back inside the bunker to set charges. As the Rebel fleet holds its own against the Empire's ships, Luke gives in to his anger and overpowers Vader, cutting off his hand. 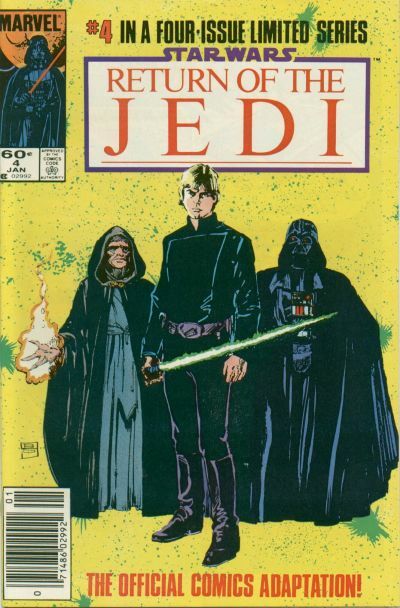 Realizing he's becoming Vader, Luke tosses away his lightsaber, declaring he's a Jedi, like his father before him. The Emperor responds by blasting him with Force lightning, but the sight of his son in pain moves Vader into action, and he tosses the Emperor down a nearby shaft, killing him. Just then, the Rebels on Endor destroy the shield generator, allowing Lando to lead a group of fighters into the Death Star to destroy it. Aboard the Death Star, Luke removes Vader's helmet and says goodbye to his dying father, then escapes just as the station explodes. Luke returns to Endor, where he is reunited with his triumphant friends. 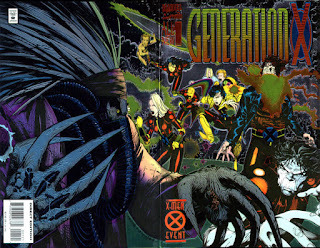 Generation X rescues new member Chamber from an attack by Emplate. Dawn at the new Xavier's School for Gifted Youngers finds Paige, Jubilee & Monet preparing for class, while Jonothan Starsmore is flying to the school via the red eye from London. At the school, Synch trains with Skin, ending with the two tangled together. Banshee admonishes them for using their powers against each other before fully controlling them, but Emma tells him it was her idea. Meanwhile, the villainous Emplate waits at the airport for Jonothan's arrival. 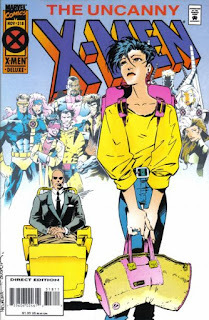 After Banshee, Jubilee & Synch leave to pick him up, Gateway suddenly appears at the school, and Monet realizes Emplate has returned. At the airport, Emplate attacks Jonothan, attempting to feed on his genetic material, but is interrupted by Banshee, Jubilee & Synch. He soon overpowers them, until the rest of the team, along with Emma, arrives via Gateway. Together, they drive off the villain, after which, Jubilee welcomes Jonothan to Generation X. Elsewhere, Emplate returns home to discover someone he's been holding prisoner is gone, At the school, Banshee confronts the mysterious Gateway, who speaks a single word - penance - before revealing he's left an unconscious young woman with red, diamond-hard skin on the lawn. Gene Kendall here, announcing the release of my final G. I. Joe novel. It took several months to complete, and because I’m not in a mood to tease any lawyers, it's free for you to download in any format at Smashwords. In an ideal world, this would’ve been published under the Kindle Worlds banner. That was not to be. Still, I felt an obligation to finish the story, and the mental gymnastics required to pull these threads together turned out to be quite the writing challenge. Wedge Antilles reveals what happened to him after the Battle of Hoth. After their long range sensors detected a nearby Rebel transport, Luke, Leia & Lieutenant Hightower investigate, with Luke fervently hoping Wedge Antilles, missing since the Battle of Hoth, must be on board. 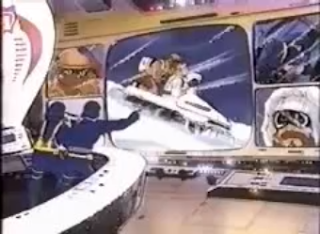 But once they enter the ship, they find it abandoned, with a only the ship's log, left by Wedge, to tell the tale of how Wedge & Wes Janson survived the battle only to be marooned on the Hoth, unable to signal for help for fear of alerting the TIE fighters, left behind to monitor the planet by the Empire. 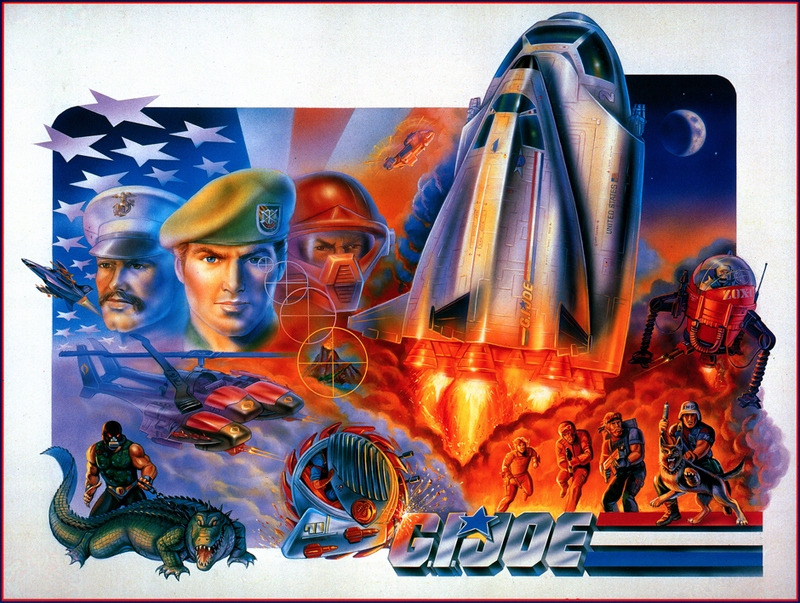 After Wedge & Wes eeked out a survival existence for several months, a group of scavengers arrived on the planet. They killed Janson, but Wedge managed to steal one of their ships, leading the rest of their craft into the path of the TIE fighters. But Wedge's stolen ship was damaged in the escape, and the log ends with Wedge noting that it is now adrift. Just then, Wedge appears outside the viewport, having been performing exterior repairs using material in the ship's hold that had been previously scavenged. Luke is overjoyed to be reunited with his friend, and the Rebels return to Arbra for a lengthy celebration. 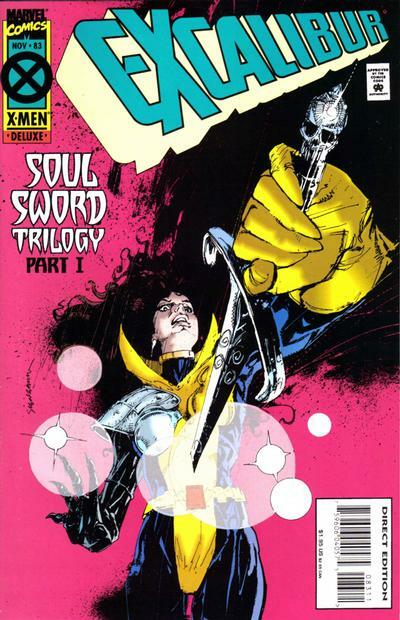 Warren Ellis' run begins as forces converge on the Soulsword. Bishop arrives on Muir Island with a shipment of research equipment, and new clothes for Kitty, courtesy of Jubilee. On vacation in Egypt, Amanda Sefton encounters her mother Margali, who warns her that Gravemoss, a sorcerer ahead of Margali on the Winding Way, is plotting to retrieve the Soulsword and use it to cement his power. Back on Muir Island, Meggan suddenly goes into convulsions while sprouting spikes all over her body. As Moira anesthetizes her, she asks Kitty for help, but Kitty ignores her. Instead, she disdainfully goes through the clothes Jubilee sent. In London, a sorceress who feels crippling pain whenever the Soulsword is drawn vows to kill the possessor of the weapon. On Muir, Kitty searches through Moira's room. When Moira discovers her, Kitty knocks her over, then draws the Soulsword from her chest & declares she'll have to kill Moira. 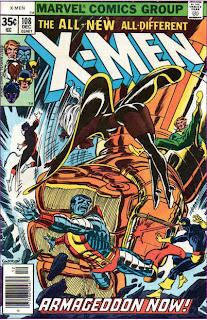 Nightcrawler, responding to the crash of Moira's fall, attempts to teleport to her room, but in the split second he travels through an alternate dimension while teleporting, Gravemoss takes control of his body. Thornn is arrested as X-Force moves into a new base. In the tunnels beneath Manhattan, Detective Hidalgo arrests Thornn for the murder of her family, murders she insists she didn't commit. 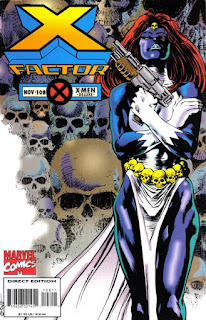 Elsewhere, Domino introduces the rest of X-Force to their new headquarters: Arcade's abandoned Murderworld. 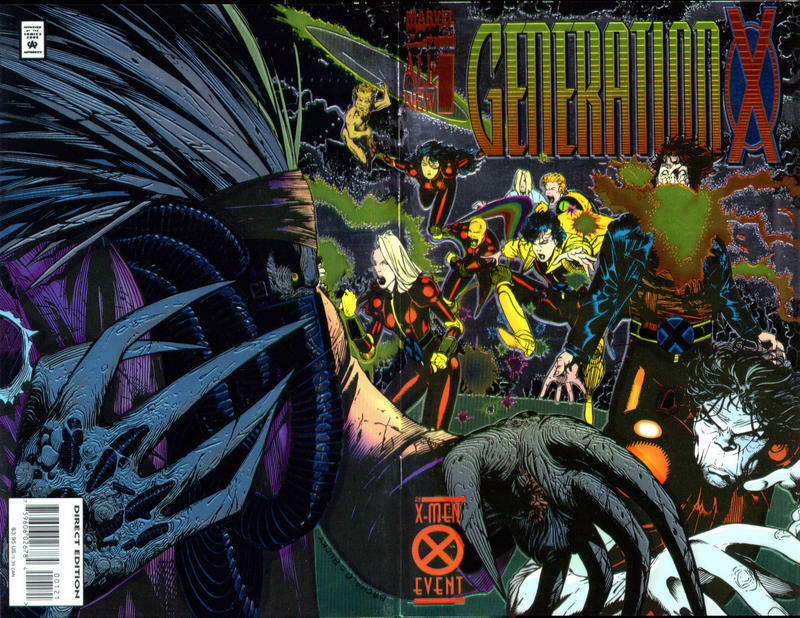 Outside Hidalgo's Bronx precinct, protesters gather, stoked by the Friends of Humanity, and at X-Force's base, Cable reveals Thornn has contacted him for help. Cable, acting as Thornn's lawyer, convinces her to tell him what really happened to her family, and then convinces Hidalgo to help expose that truth. 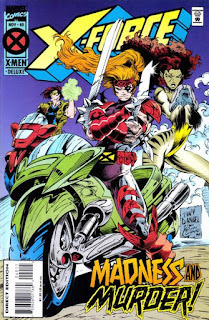 He arranges for Thornn to be transferred to Ryker's Island, and when her transport is commandeered by the Friends of Humanity, X-Force intervenes, rescuing Thornn. Along with Hidalgo, they return to Thornn's abandoned childhood home in the Bronx, where they find Feral waiting for them. 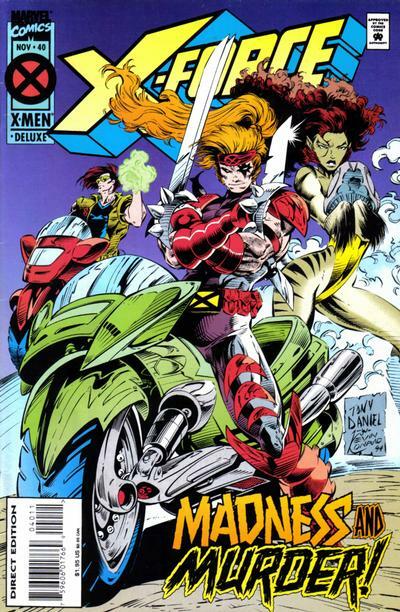 In the wake of "Phalanx Covenant", the X-Men relax and recoup. 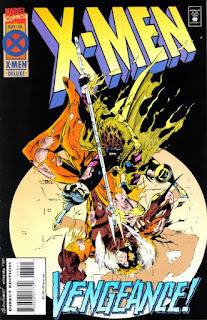 As Xavier, Scott & Jean ruminate on the recent changes to the school, Beast continues his research into the Legacy Virus while Iceman & Rogue hang out by the pool. Later, Psylocke & Phoenix train in the Danger Room before giving way for Cyclops, who is overseeing Sabretooth's daily exercise regimen. However, Gambit enters the control room tells him Jean needs his help, offering to oversee the session himself. Elsewhere, Carter Ryking is visited in prison by Adam X. Back at the school, Xavier & Bishop discuss the loss of data caused by Banshee's necessary destruction of Xavier's ready room. Elsewhere, a comatose Legion experiences a vision of Destiny. Back at the mansion, Gambit dials up the intensity of Sabretooth's Danger Room session, then attacks himself, soundly beating Sabretooth. 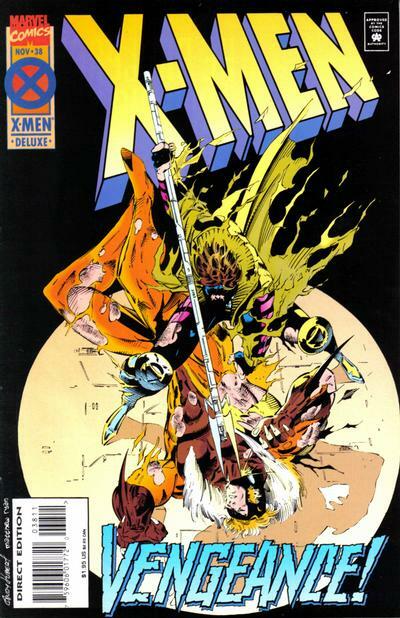 With Sabretooth at his mercy, Gambit tells him won't kill him, because being part of the X-Men means too much to him now, and that the best way to fight Sabretooth is by being happy together with Rogue, a fight which a passing Rogue wonders if they can win. As Beast takes a break from his research to go out to dinner with Iceman, Xavier, Scott & Jean meet again, and Xavier finds that, despite the group's losses & setbacks, he remains more hopeful than ever for the future. The Rebels arrive on Endor in order to destroy the protective force field around the Death Star. At a fleet gathering, Mon Mothma, Admiral Ackbar & General Madine brief the Rebels on the plan to destroy the new Death Star, including the fact that Han has been chosen to lead the mission to neutralize the shield protecting the Death Star & that Lando is leading the attack on the station itself. 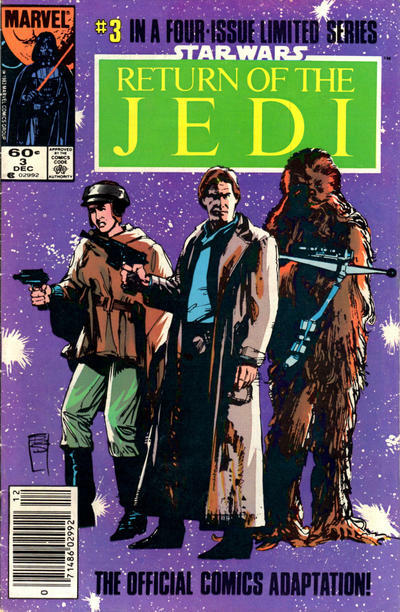 Just then, Luke returns, and offers to join Han's team. 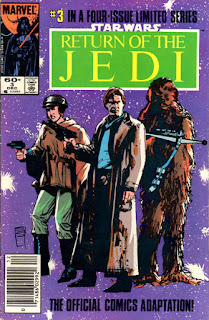 Later, Han's team arrives on Endor, and gets split up when they encounter a group of Imperial Scout troops, with Luke & Leia giving chase when they speed off. 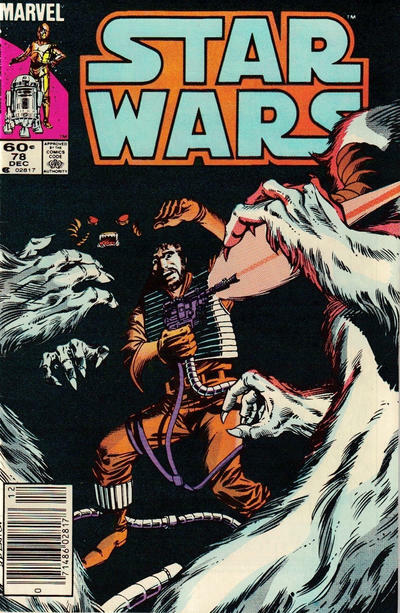 During the chase, Luke & Leia are separated, with Luke returning just in time to be captured by the native Ewoks. Believing Threepio to be one of their gods, the Ewoks bring the Rebels to their village, where they are reunited with Leia. After Luke uses the Force to make Threepio appear to have god-like powers, the Ewoks release the Rebels & agree to help them. 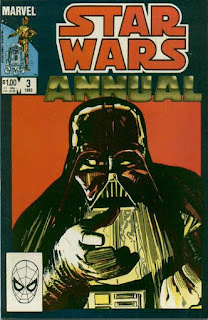 That evening, Luke tells Leia that Darth Vader is his father, and that she is Luke's sister, then leaves the Rebels, allowing himself to be captured & brought to a waiting Vader. 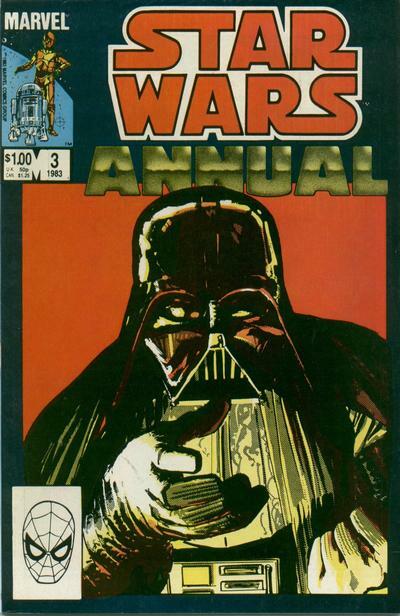 Luke insists he can sense conflict in Vader, but Vader tells Luke he's being brought to the Emperor, prompting Luke to admit that his father is truly dead. I recently had the opportunity to fill in for Jay on an episode of "Jay & Miles X-Plain the X-Men", and that episode is now available for listening/downloading! 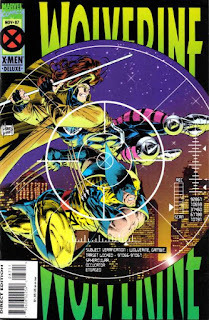 If you're not familiar with it, "X-Plain the X-Men" is basically an aural version of my X-aminations reviews, in which the hosts review issues of X-Men and the assorted spin-offs in chronological order, often featuring funny voices and recurring gags along with their cunning analysis. 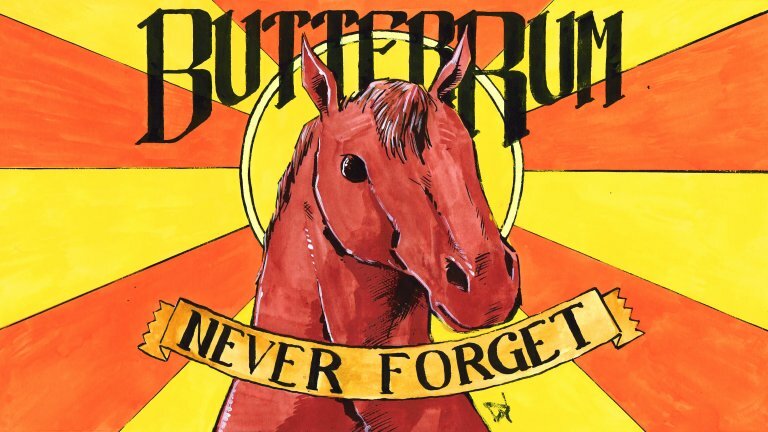 In this week's episode, Mile and I revisit New Warriors #10 and #31, in which we discuss the nebulous nature of Tarot's power, lament the lack of justice for Butter Rum, and I get to rant about the ill-advised Nova Roma/"Allison Crestmere" retcon once again! Give it a listen, and if you do, let me know what you think! Check out the episode here (links to download via various podcasting platforms are there as well).